Today we are going to Review Nokia X7-00 Smartphone. Nokia has launched its brand new smartphone Nokia X7-00 with latest technology, The Nokia X7-00 has large 4.0 inches AMOLED capacitive touchscreen of this stunning device has Gorilla glass display and sensors for auto-rotate. It is powered by Symbian Os ^ 3 with four speakers at the corners. Nokia X7-00 gives users an enhanced and extensive experience in the multimedia-rich applications are Ovi Store. Nokia X7-00 comes with absolutely unique and magnificent design and its curved corner gives it impressive unique looks. Nokia X7-00 has a 3264 × 2448 pixel display with capacitive touch screen and a stylish design. Its amazing 640 x 360 pixel resolution provides better picture quality for stress-free operation. For camera, Nokia X7-00 is equipped with 8 MP cameras with auto focus and built-in LED flash. This camera also offers an HD Ready (720p) recording Video. Nokia X7-00 is available in black. It offers full data connectivity options like Wi-Fi, GPRS, EDGE, Bluetooth, and USB. 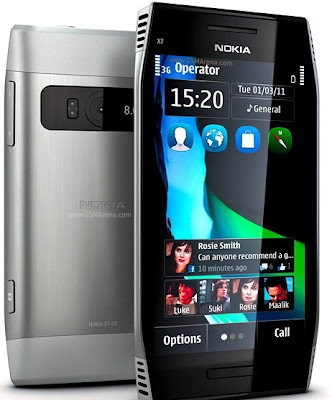 3G is now a compulsory part of all new generation mobile phones available in the Nokia X7-00 also. Nokia X7-00 also features stereo FM radio with RDS, MP3 audio player MP3, AAC, AAC +, WMA formats, video media player with support for MP4, WMV9 H.263/H.264 abd formats. Quick Office document viewer (Word, Excel, PowerPoint, PDF) is also available in Nokia X7. Nokia X7-00 will be available in Q2 2011 with the Price of €370 EUR.